Hearing aids are like shoes. Each person needs a specific size shoe to fit their foot, and each person needs a unique hearing aid program to ensure that the hearing aid is “just right” for their needs. But how do you know what you really need in a hearing aid—not want—need? Here are five questions you should ask during a hearing appointment to make sure you’re getting a hearing aid that’s “just right” for you! What options do my hearing loss and ears allow for? No two ears are exactly alike, and no hearing loss is identical to another person’s loss. The first question you should ask your audiologist or hearing specialist after undergoing a thorough hearing test is what hearing aids your ears and hearing loss allow for. Some people will have small ear canals that prevent them from using completely-in-the-canal (CIC) hearing aids, even though an available CIC product may work perfectly with their hearing loss. Other people may have such a severe loss that requires an extremely powerful hearing aid not offered in the style they were hoping to get. What are my hearing aids capable of? Knowing what a hearing aid can and cannot do is important for your lifestyle. You should come into the appointment with a list of what lifestyle elements are important to you including: exposure to noisy environments, how often you dine out, are around multiple people, have meetings at work, use the phone or want to use the phone, travel, have leisure time and more. This list of lifestyle choices will help your audiologist or hearing specialist to provide the best hearing aid options based on both your hearing needs and lifestyle choices. Do my hearing aids need other devices? After you know what your hearing aid is capable of doing, it’s likewise important to know if it can function alone, or if it needs help from an outside device or app. For example, if you want to take phone calls directly through your hearing aids, you will need to make sure the hearing aids will work directly with your phone, or if not, that you can purchase a device that will stream calls through your hearing aids. If you are an avid TV watcher, you may want your hearing aids to wirelessly connect to the TV. Finally, find out if the hearing aids use a mobile app or remote control to control hearing aid features. What happens if my hearing aids break? Hearing aids need maintenance and care just like any other technological device. They break, get old, and eventually may need repair, a professional clean or even replacement. Ask your audiologist or hearing specialist what the plan is should one or both become inoperable. Make sure you understand how long a repair or cleaning may take, how long you may be without your hearing aids and what you should do in the meantime. This will not only reduce stress and listening fatigue, but it will also maintain a positive and communicative relationship between you and your audiologist or hearing specialist. How soon will I need to upgrade? Hearing aids are an investment, but like all technological devices, hearing aids will be subject to updates, upgrades and program modifications. Be sure you clearly understand what possible updates your hearing aids may go through in the next year to three years. 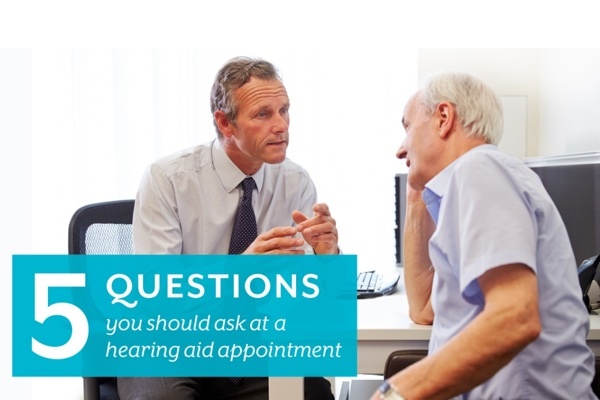 Ask about any updates the hearing aids use that are currently underway, and ask your audiologist or hearing specialist how long he or she thinks you should expect to use the devices you are taking home. Sometimes hearing loss can get worse, or as your ears adapt to the volume of your hearing aids, you may need to get the hearing aids adjusted (ex. increase or decrease the frequency range of the programs) or you may eventually need new hearing aids with more advanced technology. Are you ready to take the next step? Call Tustin Hearing Center today at (714) 731-6549! We are here to help!